As you can see from the plot description, this is not the 1963 film starring Vincent Price and Peter Lorre. Nor is it a direct adaptation of Poe’s most famous work. Instead, it’s an adaptation of the biographical play by George Cochrane Hazelton. 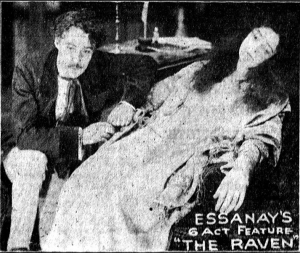 Since the novelization of the play is called The Raven: The Love Story of Edgar Allan Poe (‘twixt Fact and Fancy), it’s pretty easy to figure out that liberties with some aspects of Poe’s life were taken. But although the details might not be exact, the basic facts are present. The ancestors noted in the opening really did exist, he did have issues with alcohol, and he did suffer from hallucinations. However, most of his heavy drinking appears to have only occurred during times of great stress and is only reported to have had hallucinations towards the end of his life. It is unclear if the sequence where Poe hallucinates a version of “The Raven” is supposed to depict him experiencing one of his past works or if it is supposed to represent his inspiration for it, but it’s not true either way. However the part where he buys a slave to save him from a cruel master (portrayed by a white man in blackface) is definitely fictional. This is not a horror movie, but should hold the interest of horrors fans who enjoy Poe’s work. 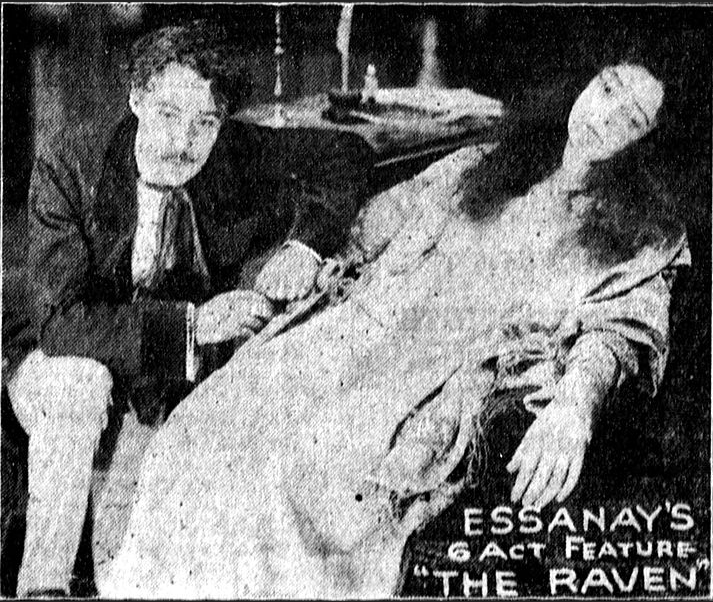 In addition to the biographical details provided by the film and the additional spectral figures added to “The Raven,” there are some genuinely funny comedy scene and the chemistry between Virginia and Edgar as depicted by Warda Howard and Henry B. Walthall (who also appeared in the Poe adaptation The Avenging Conscience) is very enjoyable to watch. Unsurprisingly, the film neglects to mention that Virgina was Poe’s 13 year old cousin! As a public domain film, it is available from several companies. The version I watched is one that I found online (as is the case with most of my reviews), so I can’t be sure which DVD of the film to recommend. What I can say is that the print I saw had plenty of print damage and tape lines. It also suffered from strobing and was so oversaturated that anything white seemed to have a strong “glow,” including the intertitles! This also resulted in many obscured faces and almost ruined the clever transition from a picture of the real Poe to the man playing him. I also noticed how the intertitles for the raven’s “Nevermore” and the ending “Lenore” speech used a completely different front and did not suffer from the glowing issue, but can’t tell if they were a stylistic choice or if someone inserted new material in order to create a copyrightable version. But said intertitles did have print damage and there is none of the new copyright information one would expect the maker of such a version would include, so I don’t know what to think. Although some sources claim it originally had a running time of 80 minutes or 57 minutes, the version I saw was only 45 minutes. I hope some company will one day give this film the restoration it deserves. I also hope you try watching it for yourself and then look more into Edgar Allan Poe’s life, because the movie leaves so many details out. Remember his struggles to sell his work? It turns out that was due to publishers preferred publishing bootleg copies of British works for free rather than pay American authors for their work! His issues with Rufus Wilmot Griswold are also left out of the film, so you’ll have to do a little reading on your own if you want to get the amazing full story.